Download Your Free Guide on How to Paint Water Today! Water that resembles realistic traits of flow and movement is perhaps one of the more challenging subjects to paint convincingly. Most artists agree that the skill is essentially painting from memory. The sea is constantly moving, and colors and light change with the time of day. Fortunately for the artist, its form and movement is predictable. By closely observing the anatomy of seas, rivers, and other bodies, you can create a masterpiece that captures the play of currents, the lapping of the ocean, and the crash of waves on the shore. This tutorial painting experts love is your essential guide to learning how to paint water. Explore water painting techniques from other experts through their shared experiences and practices. Using the expert methods in this free tutorial and improving your attention to detail of the subject, you can create more realistic water paintings. Learning how to paint water can be an intimidating process, but with our free expert tips, you can master the skill in no time. Learn how to paint waves that you can be proud of using tips on the color palette, defining shape, and making value decisions before beginning your water painting. This water painting tutorial offers step by step instructions and demonstrations to improve your skill and technique. Discover inspiration and improve your skills with free water painting techniques. Whether depicting the sea, a lake, or a stream in a painting, water presents one of the most challenging aspects of a landscape for an artist to master. These free tutorials painting experts love cover various approaches of three artists to the “moods” of water and why it’s an essential aspect of painting water. Discover what are considered to be the three basic elements to consider: flow, color, and rhythm. If you’ve always wanted to learn how to paint waves that capture the movement and light effects that occur in breaking waves, this free art tutorial on how to paint water is for you. With your free painting tutorial, you’ll have proven tips and free demonstrations to guide you through your next water painting. 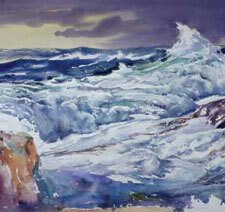 Learn the basics of painting waves from renowned artists who have experienced the challenges of perfecting the skill. Whether you’re learning to paint water for the first time or are a veteran artist, the tips included in this free guide center on the basic structure and contours of water and highlight advanced tips to continually improve your ability. New York artist, Guy Corriero’s love of the ocean has led him to perfect a technique for painting water that gives the sea a sense of form and power. “Painting the sea is essentially painting from memory,” Corriero explains,”because [it] is constantly moving and colors and light change with the time of day.” Fortunately for the artist, the form and movement of the ocean are predictable. The same motion is repeated over and over; by observing closely, one can begin to understand the anatomy of the sea. Explore Corrier’s secrets and experiences of painting waves in this free guide to water painting. Corriero depicts the sea largely through negative space, carving it out from the rocks and waves. Dark, distant seas carve out the white foam, and bold, dark rocks shape the foreground sea. If an area isn’t working, he sometimes paints over it with casein, perhaps applying watercolor over that. He also finds that casein—a medium he learned to use during his days as an illustrator—is good for creating the effect of the sun shining on the water. Follow Corriero through demonstrations of how captures rhythm gives a sense of light to his water paintings. Interesting and contrasting colors allow artist, William H. Hays to create the undulations of flow, reflection, and refraction that make the depiction of the ocean such a potent compositional tool. Whether depicting the sea, a lake, or a stream, it presents one of the most challenging aspects of a landscape for a painter to master. Hays has made the different “moods” of water an important part of his approach to landscape painting for more than 30 years. 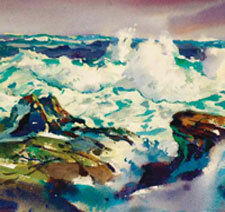 Join Hays and explore the three basic elements there are to consider when painting water: flow, color, and rhythm. 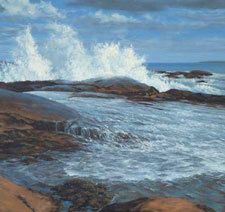 Learn how to paint water with acrylics, oils and watercolor today! The free guide starts with Guy Corriero’s unique approach to recognizing how the sea moves and circulates through close observation and a bag of tricks that involve painting sea foam, knowing the anatomy of the wave, and using a particular kind of brush. William Hays talks about how color contrasts are his key compositional tool for the reflection and refraction of light on different bodies of water—shallow pools, shorelines, and offshore depths. Plus there are three step-by-step water painting demonstrations that breakdown the essential elements of painting water.